Our guide will expect you outside the Arrival Hall of the Capital Airport after you go through the customs. A comfortable private drive will take you to the hotel for a three-night registration. Relax for the remainder of the day to recover from the jet leg. 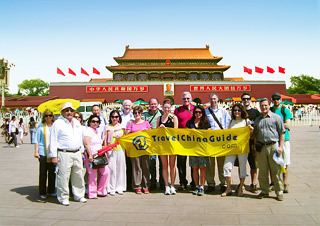 After breakfast, your 15 days China tour starts from the largest city square in the world, Tiananmen Square. Walk to the Forbidden City after a short stroll around the square. As the world's largest imperial palace complex, the 590-year-old Forbidden City presents you splendid imperial buildings and a large collection of historical items. As it is our practice to avoid the cheap tourist restaurants, you will enjoy an a la carte lunch (valued at CNY150.00 per person and included in our price) at a noted local restaurant to taste the authentic Chinese food. Your visit continues to the Temple of Heaven in the afternoon. Built in 1420, it was the imperial altar where emperors of the Ming and Qing dynasties worshiped heaven for good harvest. The most attractive sites there are the Hall of Prayer for Good Harvest and the Echo Wall. Today's visit starts from the excursion to one of the greatest world heritage sites, the Great Wall at Mutianyu, which is one of the best-preserved sections of the Great Wall and features solidity, majesty and its strategic importance. The round trip cable car will be arranged for you to go up and down the wall. Today's lunch is on your side. Our guide will be pleased to offer you some suggestions upon request. In the afternoon, when passing by the Bird's Nest (Olympic National Stadium) on the way back to downtown, you will have a short stay there and take some photos with the huge nest. A popular local market will be your last stop today. The first stop this morning is the largest royal garden, the Summer Palace, where you will see traditional Chinese garden architecture merged into the natural landscape of hills, woods and lakes in the most harmonious way. Enjoying the rickshaw riding through Hutongs will be your memorable experience. Here you will feel the special Beijing culture and history by visiting the famous romantic Shichahai Lake, classic Silver Ingot Bridge, dazzling Skewed Tobacco Pouch Street, grand Bell tower or Drum tower and local flavored family. Lunch is not included today. In the afternoon, you will head for Xian by a high speed train. Your local guide will meet you and accompany you to check in the hotel. In the morning, you will visit the Terracotta Warriors and Horses Museum, which is famed as the eighth wonder of the world. 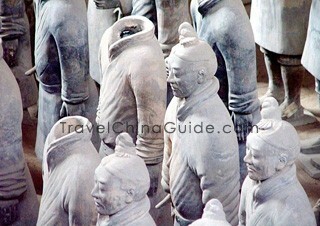 As an underground army served to protect the mausoleum of the first emperor Qin Shihuang, the first emperor of 2,200 years ago, the clay warriors and horses with distinct facial expressions and positions were arranged orderly in rectangular battle formations. The Bronze Chariots and Horses and weapons excavated here are also amazing parts of the museum. Lunch is not offered today. Then, get back to downtown district and visit the Big Wild Goose Pagoda, which is considered the symbol of the city. Built over 1,300 year ago in the Tang Dynasty, the seven-storey square cone-shaped pagoda has seen huge changes and development of Xian City. Then you will visit the Provincial History Museum, one of the best museums in our country. Today's visit starts from another landmark of this ancient capital, the City Wall. If time permits, you can either walk or rent a bicycle to ride around on the wall to discover the history and modern beauty of the city by yourself. After that, you will proceed to Chongqing by flight, where your local guide will provide you with comfortable transfer service. Your memorable Yangtze River cruise will begin after you board the comfortable ship. The river guide will give you a brief introduction of the cruise and the itinerary after breakfast. You can walk around on the deck and enjoy the picturesque scenery of clear water and grotesque hills and peaks along the river in the morning. Then you will disembark and take an initial onshore excursion to the legendary Shibaozhai with a history of over 400 years or Ghost City of Fengdu. The Captain's Welcome Party will be held tonight. The highlight of your cruise experience comes today - you will appreciate the unique scenery of the Three Gorges, which is composed of Qutang Gorge, Wu Gorge, and Xiling Gorge. As you sail on to the border between Wu Gorge and Xiling Gorge, you will disembark and take an interesting junk adventure along Shennong Stream, where you will sit on the special local sampan and enjoy the breath-taking scenery of rip currents, lofty peaks and mountains, gorgeous Karst caves, beautiful waterfalls and many historical relics. 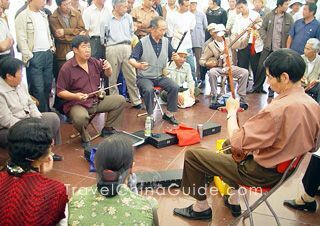 Besides, the boat trackers' beautiful folk songs will accompany you on the way. The adventure lasts about 3 to 4 hours. Or, you will have a motorized ferry excursion to Three Little Gorges instead according to the arrangement of cruise company. 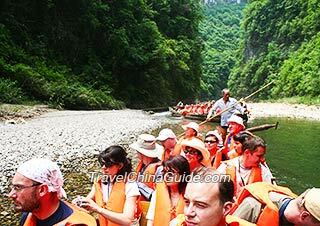 When embark again, you will sail into the Xiling Gorge, which is the longest and most gorgeous one among the three. In the morning, you will check out the ship and disembark for an excursion to the Three Gorges Dam, the largest water project in the world. Standing on the gigantic dam, you can not only enjoy the grand view of the river blocked by the dam and endeavoring to pass through it, but also have a bird's eye view of the beautiful scenery around the dam. Afterwards, the cruise ship company will drive you to the Three Gorges Tourist Center in Yichang city and our local guide will be waiting for you there. 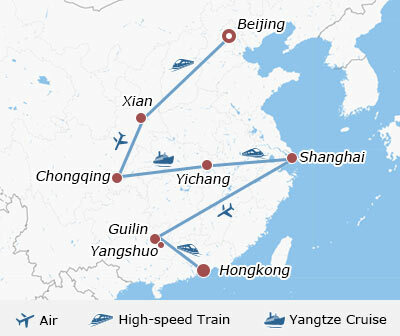 Then you will be escorted to the railway station and head for Shanghai by a 7.5-hour bullet train. Your local guide in Shanghai will expect you at the railway station and transfer you to the hotel. Your private day tour starts from one of our best museums, Shanghai Museum, which is renowned for the large collections of historical items, such as bronze ware, chinaware, Chinese paintings and calligraphy works. Then continue to the famous Yuyuan Garden, which is a traditional Chinese garden with delicate buildings, exquisite layout and beautiful landscape. Around noon, you will have a sumptuous a la carte lunch (valued at CNY150.00 per person and included in our price). After lunch, proceed to the Bund area, and take a Huangpu River cruise, enjoying the different scenes on the two banks of the river: the skyscrapers on the east bank while old-style western buildings on the west. 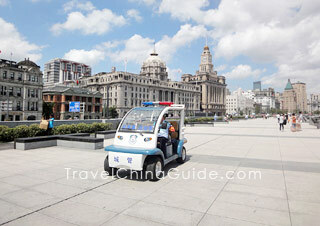 After that you will explore the Bund area and then visit an impressive old street. No escorted sightseeing is scheduled in the morning so you can explore the city on your own. You may take a taxi to the newly rising Xin Tian Di (New World area) where the buildings perfectly combine both classical Chinese and western styles. The pubs and cafes there are very popular with local residents as well as foreign travelers. People at Xin Tian Di can almost speak some English, so basic communications will not be a problem. In the afternoon, you will head to Guilin by air. 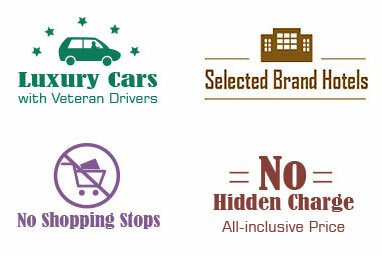 Our local guide will greet you with our comfortable airport-hotel transfer service and help you check in the hotel. Your Guilin sightseeing starts from the elite of it, Li River Cruise. As you cruise down to Yangshuo town, you will see the splendid scenery of peaceful river and elegant hills all the way. 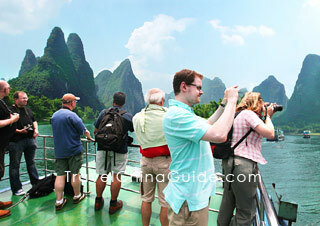 The cruise lasts around 4 hours and reaches terminal Yangshuo at about 14:00. As the cruise company offers box lunch on the ship. It may fail to meet with your approval. TravelChinaGuide is aware of the shortcomings and suggests you prepare for the cruise with a generous breakfast at the hotel. Upon arrival, you will be driven along the countryroad to enjoy the natural beauty of Yangshuo, and a family visit on the way to learn about the local farmers' life. 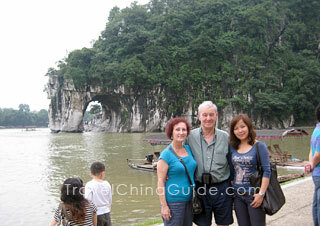 After the sightseeing in Yangshuo, you will return to Guilin by our private car. Today you will visit the famous attraction in the city area, the Reed Flute Cave, which is well-known for the exquisite stalagmites and stalactites with interesting names. Then your guide will see you off for a 3.5-hour's high speed train to Hong Kong. Upon arrival, you will head to the booked hotel by yourself. If you stay in the Regal Kowloon Hotel, you can take 10 minutes' walk to the Austin Station of West Rail Line and then take MTR to East Tsim Sha Tsui Station. After that, walk for around 10 minutes to get to the hotel. Or you may take a taxi directly, with the cost of around HK$30. If you stay at the InterContinental Grand Stanford Hong Kong, the hotel provides free shuttle bus service. You may contact the hotel and book in advance. Full day is free for you to explore the city on your own. We only reserve the hotel accommodation with daily breakfast for you in Hong Kong. Hereunder are our suggestions for your exploration, you can also make your own arrangement. 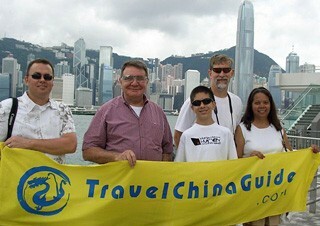 In the morning, you can have a half-day Hong Kong Island trip. Take a bus or taxi to get to the Victoria Peak. The Repulse Bay, Aberdeen and Stanley Market are all the must-sees in this great metropolis. Finally you will come to the pier to take the Star Ferry to Kowloon and then walk along the waterfront back to your hotel. If feel interested, you could visit the Victoria Harbor to watch the wonderful A Symphony of Highlights at 20:00. If you travel with children, the Disneyland should not be missed in your family tour. Today you will head to the airport for your return flight by yourself. Please consult the hotel bellboy about where to take the limousine to the airport, or you can take free bus K3 to Kowloon station, from where you could transfer to the Airport Express directly. Wish you a pleasant journey home! I want to take the Maglev train, then taxi to the hotel. I read that there are potential scam in taking taxis from Longyang Station. So maybe I should transfer to subway line 2 and get off at East Nanjing Road, then take a taxis? Or is it safe to walk the 1 kilometer from the station to the hotel? Well, you can choose a transfer to Line 2, and get off at Nanjing Rd (E) from Exit 4. As for the safety problem, I think you don’t need to worry, since your hotel is in the downtown district, there are always so many people, so you can walk there if you are not carrying much luggage. 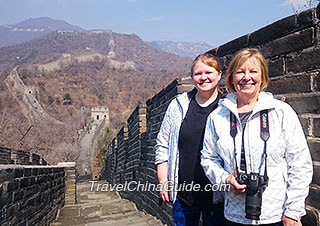 Whats the difference between Li river cruise and Yangtze river cruise? Li River cruise is a 4-hour cruise starting from Guilin to Yangshuo along Li River to see the karst landscape and country scenery. Yangtze River cruise is a 4-day-3-night cruise along the Yangtze River starting from Chongqing to Yichang, to see scenery of the Three Gorges and Three Gorges Dam. What is the dress code for the captain's dinner? What is the dress code for the captain's dinner on the cruise portion of this trip? There is no requirement on dress code when attend captain's dinner on cruise or other evening shows during the trip. You may wear the comfortable clothes. However, some people may like to dress well for such occasion. Hi, Im Daniela from Bolivia, I wanted to know what is included in the price? I wanted to know if the price of this route include the cost of the flights between cities, and the cost of the hotels? Yes. The price includes the hotel accommodation and the economy class airfare between cities listed in the itinerary. However, the international flights of arrival in Beijing and departure from Hong Kong will be on your side. Wearing your summer clothes will be ok during this period. Generally, the weather will be comfortable most of times with little rainfall. On the other hand, please prepare a long-sleeved jacket in case of the cool air in the early morning.